In 2019 WPSR is celebrating its 40th year! We created this video to highlight just a few of the wonderful people and key events from our first four decades. Thanks to Ken Lans and Jason Merges for putting this video together! WPSR is proud to support the Healthy Environment for All (HEAL) Act, currently making its way through the legislature in Olympia. These bills (SB 5489 and HB 2009) create a shared definition of environmental justice for state agencies, ensuring that health disparities are reflected in investments, policies, and other programs . 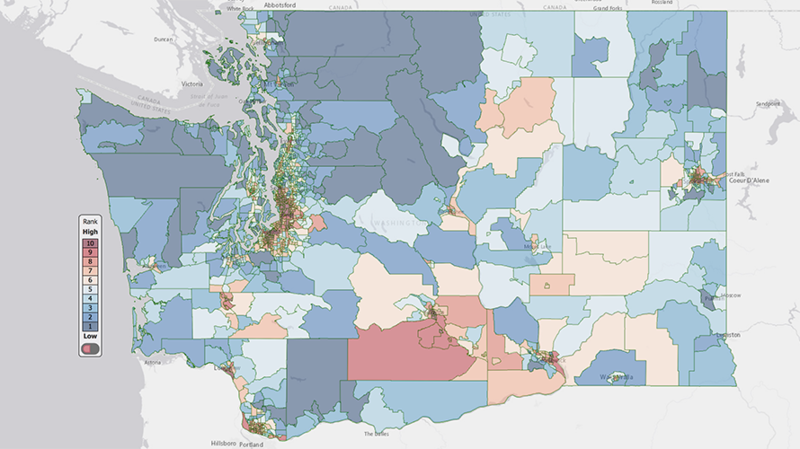 The recently-released Environmental Health Disparities Map, developed by Front & Centered with the University of Washington and the state Department of Health, illustrates that certain Washington communities are disproportionately impacted by air pollution and other environmental indicators that harm health. This new tool reinforces that those suffering from environmental injustice must be the first to shape policy decisions to better ensure that where you live doesn’t dictate your health. Dr. Ken Lans recently testified to the House Environment Committee in support of the bill. See his testimony and contact your legislator today in support of the HEAL Act! Ken standing outside the state capitol in Olympia with Front & Centered leaders and staff. My name is Ken Lans, I’m a retired General Practice Physician and the Past-President of Washington Physicians for Social Responsibility, a non-profit with a 40-year history of health-based advocacy in our state. I’m writing to urge you to pass the Healthy Environment for All Act, SB 5489, out of your committee this week. As a doctor, I know through my own experience that healthy brains, hearts, and lungs are needed for people to thrive and meet their full potential. Living in an environment free from pollutants and toxins is absolutely critical for everyone’s health and normal development. It is an injustice — one that we can correct — that too many people in certain communities in Washington face worse health impacts because of where they live. In practical terms, minimizing such exposures requires first being aware of them and taking them into account. The health-disparities mapping analysis tool, that is part of this legislation, provides an informative, easy-to-use framework for each agency to identify and map out which populations are most vulnerable to a given environmental threat. These individual exposures don’t act in isolation, they compound on each other. Along with the growing impacts from climate change, these exposures to pollutants further increase the vulnerabilities that medically-sensitive populations already face. All this severely strains our healthcare system, dramatically raises health care costs, and needlessly siphons away money, resources, and productivity. I urge the state to make the targeted investments to reduce environmental health disparity that can benefit every Washington community — helping each and every one of us reach the promise of a healthy, happy, and productive life. I urge you to please support the Healthy Environment for All Act, SB 5489. Thank you for all the work you do to represent us. Senate Joint Memorial on preventing nuclear war moves forward! Washington Against Nuclear Weapons had a great day on Friday, February 22nd. We are delighted that the Senate State Government, Tribal Relations & Elections Committee voted in favor of Senate Joint Memorial 8006, which now sends it to the Rules Committee. Ten individuals representing Washington Against Nuclear Weapons and Washington Physicians for Social Responsibility testified in support of SJM 8006, a measure that – if passed – would send a request to President Trump and the leaders of both houses of Congress to take specific actions to pull our country back from the brink of nuclear war. We are grateful to Sen. Hasegawa for introducing SJM 8006 and to Rep. Tarleton who introduced HJM 4008 in the House. We are also grateful to the co-sponsors of these Memorials. And we are especially grateful to all of the individuals who attended Friday’s hearing, testified in support of SJM 8006, and/or contacted their legislators urging support of this measure. One memorable moment on Friday was Senator Hasegawa’s introduction of SJM 8006 to the Committee. When he mentioned the large collection of nuclear weapons housed in Washington State at Bangor, the gasp in the crowded room was audible. That gasp reminds us of what an important opportunity this is to educate our fellow Washingtonians about the immense risk we face. Onward in the quest for a safer future! People in Washington State find ourselves in a crossfire of the New Nuclear Arms Race, since the presence of nuclear-armed submarines at the Kitsap-Bangor Naval base makes us a prime target in the case of a nuclear exchange. On Friday Feb. 22, for the first time since the end of the Cold War, Washington State Legislators are stepping up to say No More to nuclear proliferation and are standing up to Nuclear War and the New Arms Race. The risks of international conflict, escalating to include the use of nuclear weapons, have reached levels not seen since the height of the Cold War. Recently renewed conflict between two unpredictable nuclear-armed nations, India and Pakistan threaten global security. The continuing uncertainty surrounding North Korea’s nuclear arsenals; paired with aggressive policies of the Trump administration, which involve a new nuclear arms race combined with irresponsible threats involving nuclear weapons and a total breakdown of existing arms control treaties (such as the Intermediate-Range Nuclear Forces Treaty), have combined to create a frightening and dangerous international environment. These multiple nuclear crises are finally being addressed with a bold and visionary pair of initiatives in the Washington State Legislature. These Joint Memorials, led by Sen. Hasegawa in the Washington Senate and Rep. Tarleton in the House, propelled by the public, call for the U.S. Congress to “take appropriate steps to move back from the brink of nuclear war.” The Washington Against Nuclear Weapons coalition applauds Sen. Hasegawa and his colleagues for holding a hearing on Senate Joint Memorial 8006 Friday, February 22nd, 1:30 PM, by the Committee on State Government, Tribal Relations and Elections. Directed at President Trump and the leaders of both houses of Congress, if passed by the Washington Senate (and House), these Memorials would represent very bold statements regarding nuclear dangers addressed to our national leadership from the highest levels of Washington state government. Two similar resolutions were passed by the state of California last year. SJM 8006 urges that Washington “has a local responsibility to lead a national conversation about reducing and eliminating the threat of nuclear war and revamping our federal strategy.” The Memorial goes on to urge the U.S. to lead a global effort to prevent nuclear war by laying out several policies aimed at reducing the extreme risks from these weapons as well as reducing our arsenals. The Washington Against Nuclear Weapons coalition, comprised of over 40 organizations across Washington, and Washington Physicians for Social Responsibility, an organization of over 800 health professionals, strongly support passage of these Memorial statements, and commend our elected officials for their foresight and leadership in putting them forward in the 2019 Legislature. “We are fortunate to have this quality of leadership in our Washington Legislature that is willing to challenge the very dangerous status quo and address these policy issues that ultimately reside at the national level,” said Dr. Bruce Amundson, Vice President of Washington Physicians for Social Responsibility. Gerald Cufley, MD, makes the case for a moratorium on new major fossil fuel infrastructure. 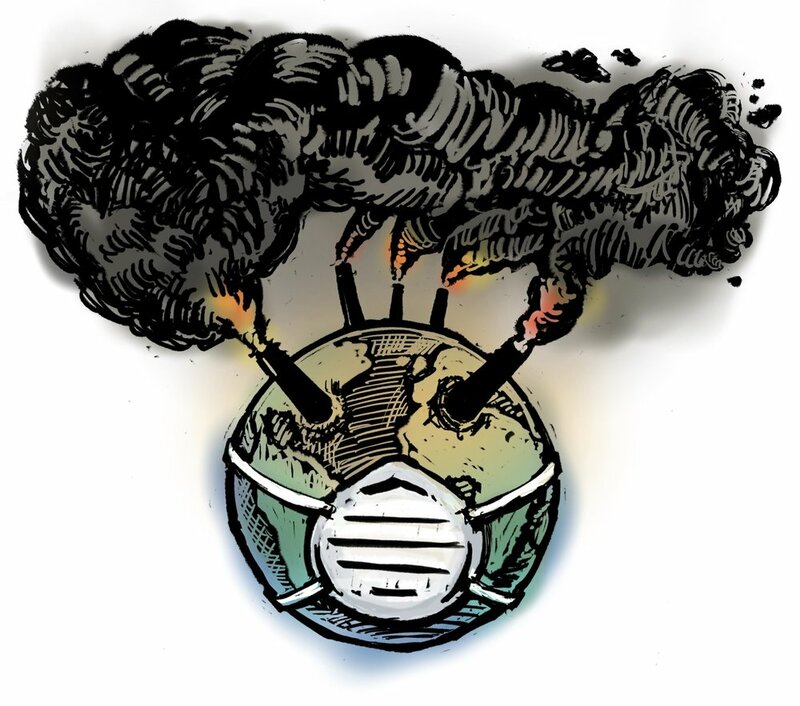 “Climate change is killing our patients,” WPSR physicians write op-ed in Seattle Times. New reports from The Lancet medical journal, a World Health Organization study, and the recently published US Climate Assessment confirm what Washington healthcare providers are already seeing: climate change is hurting our patients. Health professionals in Washington are already mobilized to take action on climate change. An unprecedented medical coalition representing thousands of Washington physicians and nurses endorsed the carbon fee ballot initiative, I-1631. Medical providers have been key players in coalitions that have successfully resisted construction of new fossil fuel infrastructure and will advocate for statewide emissions-reducing policies next year in Olympia. “As physicians called to prevent what we cannot cure, this report confirms that it is our duty to do everything we can to ensure a livable future for our communities and our patients,” said Dr. Anita Peñuelas, family physician and WPSR Climate & Health Task Force member. This was a big week…nay, year!...for WPSR and our work to address climate change and its health effects. We were an early and strong supporter and helped write Initiative 1631, a climate justice policy that would have put a fee on greenhouse gas pollution and invested in clean energy projects in Washington communities. As we all get some rest and process Tuesday’s results, we wanted to share with you our reflections. Unfortunately, we lost this one. We didn’t overcome the more than $31 million that the oil industry spent on an unprecedented misinformation campaign to defeat this measure. That's a bitter pill to swallow, but now let’s get on with the good news. We built a major climate justice movement in WA, one whose strength drew an enormous backlash from the oil industry. Over the last several years, we have worked alongside an amazing diversity of stakeholders, including environmentalists, labor unions, faith leaders, communities of color, businesses, and tribal nations. We established a vision for addressing climate change while especially protecting the most vulnerable among us. Our efforts have inspired people far beyond our little corner of the country to contemplate putting a price on climate pollution. WPSR in particular proved that a relatively small group of intensely dedicate people can have an outsized impact. WPSR members gathered over 9,000 signatures to get Initiative 1631 on the ballot. We knocked on thousands of doors and made hundreds of calls to talk with voters about why we support I-1631. Our physicians appeared in campaign ads; nurses appeared in television interviews; and public health researchers wrote op-eds. WPSR also strengthened our relationships with a number of leading organizations and individuals within Washington’s medical community. We sought endorsements from a number of local, state, and national organizations, and many of them stepped up to confront the threat that climate change poses to our health. Organizations representing thousands of health professionals, including Washington State Medical Association and Virginia Mason, endorsed the initiative – for which we are so grateful! WPSR members did not sit on the sidelines and hope for the best, nor did they feel their work was done after endorsing the initiative. We gave it our all, signaling to the public that climate change is very much a health issue. While the results of this week’s election were not a home run for climate justice, there are so many things to be grateful for. Working with many of you on this campaign has been a joy for us. The dedication of our members to the cause of climate justice has been truly inspiring. When WPSR first joined the Alliance for Jobs and Clean Energy four years ago, we could not have guessed that our physicians and nurses would be gathering signatures at farmers markets and doorbelling in their white coats. We could not have imagined that several WPSR physicians would be among the campaign volunteers who gathered the most signatures to get I-1631 on the ballot, and who knocked on the most doors to talk to voters. You came to rallies and held signs. You spoke at press conferences, some of you for the very first time. You wrote letters to your local papers. You initiated conversations with your coworkers during lunch. You entreated your workplaces to endorse the initiative. You hosted informational events in your home. We have heard many times from our partners in the Alliance for Jobs and Clean Energy that the health community “punched above its weight” in this campaign. Thank you! We have built such an amazing network of health professionals pressing for action. We must build on this momentum, and advocate for policies that will protect health from climate change. We will advocate for bills during the upcoming legislative session. We will work with local health professionals to support community-based initiatives to transition to clean, renewable energy. We will educate medical students about the links between climate change and health. We will train health professionals to understand and amplify the health co-benefits of acting on climate change. What we must not do is give up. We do not have time to wait for others to act. We must fuel our sense of urgency into continued education and advocacy. Our patients are depending on us. Our communities are depending on us. Our grandchildren are depending on us. Thank you for your hard work and your support during this campaign. Last month, WPSR Climate & Health Task Force member Nate Matthews-Trigg led a webinar for youth activists with the organization Our Climate on climate change as a health issue. The presentation focuses on understanding the health impacts of climate change, and how activists can use the topic of climate change and health to promote mitigation and adaptation actions, policies, or general awareness. Close to 1.5 hours in length, the presentation is a helpful resource for new and seasoned advocates alike. The audience should already have a basic understanding of climate change. The discussion questions at the end can be used to facilitate small group discussions or act as writing prompts. Feel free to use, share, or alter this presentation, which you can find on the “Climate and Health Advocacy Resources” page on our website. However, do give credit to Nathaniel Matthews-Trigg! On July 19th, WPSR Executive Director Laura Skelton joined leaders from Environment Washington, Sierra Club, Washington PIRG Foundation, King County Executive Dow Constantine and King County Metro Transit in recognizing the County's commitment to bus electrification by 2040. I’m here on behalf of hundreds of physicians, nurses, and other health professionals in WA Physicians for Social Responsibility who recognize climate change as a growing health crisis. One of the best ways we can take care of people and patients is to champion policies that fight climate change and ensure a livable environment. King County's electrification of public transit is an important means both of addressing climate change and protecting health. Transitioning to electric vehicles will help our communities realize immediate health benefits. Pollution from vehicle exhaust has been linked to cancers, respiratory ailments, cardiovascular disease, and premature death. Diesel exhaust accounts for 78% of the potential cancer risk from all air toxics in the Puget Sound area – and a third of that diesel exhaust comes from on-road vehicles. Instead of diesel, let’s go electric! 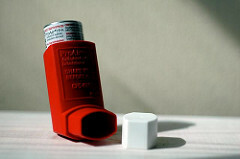 Bus electrification will especially help protect the more than 600,000 Washingtonians who suffer from asthma. Not surprisingly, asthma rates and other respiratory ailments are higher in communities along heavy transit corridors. Because low-income residents and communities of color are more likely to live along these corridors, they bear a disproportionate burden of the consequences of our fossil fuel use. To fight this injustice, let’s go electric! Moving to electric buses will immediately result in cleaner air, protecting some of the most vulnerable members of our communities. It will also protect health long-term, by mitigating further climate change. This is truly a win-win. We are grateful for King County’s leadership in transit electrification. In order to protect our climate and the health of Washingtonians, we hope that more communities will follow King County's lead. Let’s go electric! You did it! On Monday, July 2nd, WPSR members and staff joined our partners in the Alliance for Jobs and Clean Energy coalition in Olympia to turn in 377,000 signatures to get Initiative 1631 ("Clean Air, Clean Energy") on the ballot. We are honored to play a leading role and represent the health voice in this unprecedented coalition of tribal nations, communities of color, labor unions, and environmental groups working to improve the lives and health of all Washingtonians. 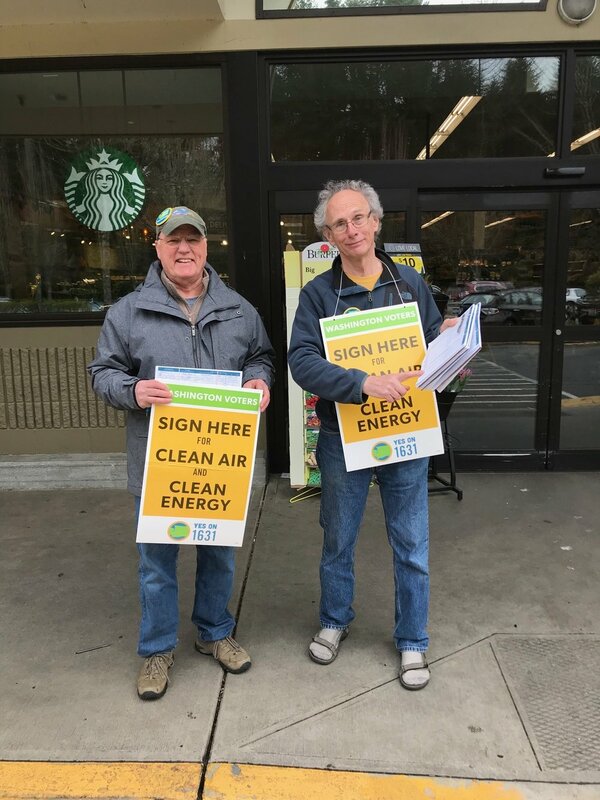 Over the past four months, volunteers gathered thousands of signatures for Clean Air and Clean Energy. From Farmers Markets, to rainy light rail stops, to retirement home lobbies and gatherings of friends, health activists were unstoppable. Together, WPSR members gathered over 8,368 signatures. We are amazed by your efforts and activism - thank you for helping us get here. At the signature turn-in press conference, Dr. Mark Vossler (cardiologist and Chair of WPSR’s Climate & Health Task Force) gave the following remarks. He was joined on the speakers list by WPSR intern Jade Lauw, also a fellow with the youth advocacy organization Our Climate. Mark gathered nearly 1,000 signatures and played a leading role in the East King County signature drive campaign. We’re inspired by his efforts and those of our entire team. Supporting I-1631 through health-based advocacy is a priority for WPSR’s Climate & Health Task Force. As we gear up for November, we’re getting ready to speak loudly and often about the imperative of putting a price on carbon pollution, supporting communities most vulnerable to climate change, and investing in clean energy. From talking to friends and neighbors, to writing op-eds and letters to the editor, there will be countless ways to support this critical effort. “Clean Air! Clean Energy! What’s not to like?” I remember my first signature gathered in the campaign. The woman who signed on a rainy April day outside PCC said those words to me while she grabbed the board and then about to sign asked, “What’s this about?” As I briefly explained the proposal she said, “You had me at clean air.” That experience has buoyed me through the rest of the campaign. I joined Washington Physicians for Social Responsibility to work on preventing that which we cannot cure. I took time away from my medical practice and my family to volunteer for Yes on 1631 because I know that climate pollution is affecting real people right now. I committed every free moment I had to the effort because there was nothing else I could have done over the past three months that would have had a greater impact on the health of our community. I know that the air pollutant co-riders with carbon are affecting people in Washington right now. I’ve read the studies showing increased heart attacks and strokes related to “bad air days." I’ve seen my own patients coming to clinic with worse heart failure and worse asthma when the particulate counts are up. The health impacts of our continued addiction to fossil fuels hit the most vulnerable the hardest, from little kids with asthma to the frail elderly with heat stroke to residents of impoverished low lying coastal villages with water supplies flooded with sewage. Yet these vulnerable communities have done the very least to contribute to the problem. It is repulsively immoral that our nation continues to promote interests of dirty energy barons on the backs of the sick, the infirm, the young, the old and the poor. We aren’t willing to let the naysayers hold us back. I feel so privileged to be able to work with so many amazing diverse groups who are ready to stand up for their communities. This coalition truly represents all of Washington because having clean air and a health place to live affects all of us. The health of people in our community is NOT a special interest. It is everybody’s interest. So Yes! Yes! Yes! On 1631…It can be done!! WPSR members and staff gathered 8,368 signatures to get I-1631 on the ballot!